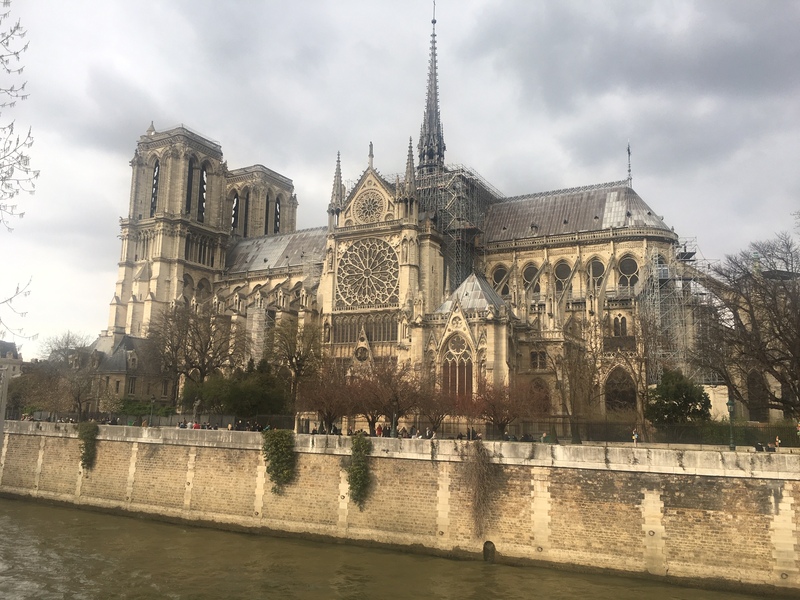 Notre Dame Cathedral 3 weeks before the fire. As you may know during the Easter Triduum we read the four gospel accounts of the passion of our Lord at table, preempting whatever table reading has been in progress. As luck would have it today at lunch just before the end of the meal we concluded the pope’s post-synodal apostolic exhortation to young people, Christus vivit. With but a few minutes left in the meal, and not yet ready to start the passion accounts, the prior had the inspired idea to read something related to current events. So we read Zac Davis’s “Grieving the fire of Notre Dame during Holy Week,” from America Magazine. As we finished the article, the abbot rang the bell indicating the end of lunch. We are now ready for the reading of the passion accounts. Yes, we just finished reading another presidential biography at table, but this time not for one of America’s historical giants, but for the sad case of a man shot and killed in his inaugural year. Usually, I put the title of the book in the blog post title, but strangely the new biography of Garfield does not name him there or in the subtitle, Destiny of the Republic: A Tale of Madness, Medicine and the Murder of a President by Candice Millard. The narrative makes for a moving story of an accomplished man who unexpectedly becomes president. I appreciated the book for learning a lot about a period of American history with which I am less familiar, including its presidents. Did you know that Garfield survived 80 days after being shot by Charles Guiteau? He most likely died from the treatment for the bullet wound than the bullet itself. Alexander Graham Bell was involved in Garfield’s treatment. One of his cabinet ministers, Robert Todd Lincoln, the son of Abraham Lincoln, was at his bedside after the shooting, much like he had stood at his father’s bedside 16 years earlier. And I regret to say that prior to this book if you had asked me to tell you all I knew about Chester Arthur I could have possibly told you but one historically accurate sentence. Now I’m sure I could come up with several sentences about Garfield’s vice president and successor. A few weeks back we finished the biography of Saint Paul by the biblical scholar and Church of England bishop, N.T. Wright. He writes [I know] about what led to Paul’s conversion on the road to Damascus and explores why his evangelical activities met with so much success. This is a very fine and accessible treatment of the letters of Saint Paul and his journeys recounted in the Acts of the Apostles. Last week we finished Jamie Sayens’s You Had a Job for Life: Story of a Company Town at table. Those of you who have been following this blog for a few years know that there are certain genres of non-fiction that we read frequently for table reading. In addition to all manner of Catholic fare we do have a tradition of reading many histories, especially presidential biographies. A small genre that we occasionally read has to do with works about New Hampshire. We read a book about a German POW camp in Stark , NH [before I started blogging] and then another work more recently about the sweepstakes in NH. The Sayens book falls into this category. The town of Groveton, NH had had a paper mill since the nineteenth century and Jamie Sayens, through both documentary and oral history, captures the life of that paper mill, and a plus-one-century old paper machine, and its employees until the plant’s closure in 2008. The narrative picks up steam as the author moves through the decades, especially as we get to know individual employees and their characters well when he, Sayens, moves into his conversations with living former employees of the mill. While the book worked well for our table, I’m not sure how well it would transfer to monastic table reading for non-New Hampshire monasteries. It also would require a fair bit of editing, as some of the former employees use rather (ahem) colorful language in their descriptions of their time at the mill. Also a candidate for heavy editing would be a gruesome section that dealt with industrial accidents at the mill where employees were maimed or even died on the job. One especially unnerving description of the death of an employee occurred at the end of our table reading one day. It was thus repeated at the beginning of the following meal (as per our custom). The employee describing it (p.50) said, “It was horrifying… I didn’t eat for a few days afterwards.” And yet we, the monks not the paper mill employees, all kept dining, though perhaps a bit paler, through this description!